Gagosian is pleased to present I’ve Seen Gray Whales Go By, new paintings by Mary Weatherford. This is her first solo exhibition with the gallery. 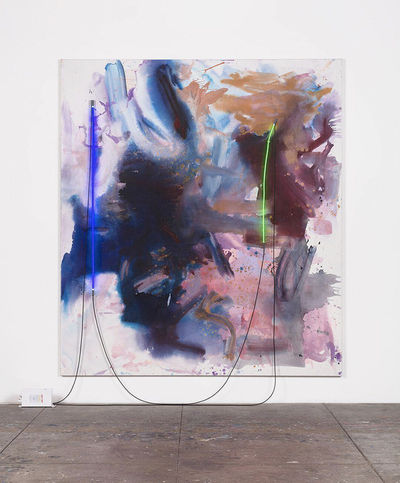 Weatherford makes large paintings comprising grounds of spontaneously sponged paint on heavy linen canvases surmounted by one or more carefully shaped and placed colored neon tubes. The canvas—prepared with white gesso mixed with marble dust, and worked on with Flashe paint, a highly pigmented but readily diluted emulsion—supports startlingly diverse applications of color. The surface of the paint ranges from matte and velvety to transparent and translucent. The canvas is at times densely filled, reading as a painterly continuum; at others, it shifts in color from edge to edge of the painting; and at yet others it contains clusters of marks set in relatively bare surroundings. And the color itself varies significantly: blurred blues, muted yellows and carnival reds; mineral hues, evoking slate or steel; pinks suggestive of fruit or flesh; and many different blacks, recalling shiny feathers. The neon tubes attached to these fields of color advance a unique practice that Weatherford began in 2012, inspired by illuminated signs along the streets of old Bakersfield, California. In her use of neon, she transformed what had previously been used for advertising—and had been appropriated as such by earlier artists—into a radically new form of pictorial drawing. Casting an industrial light onto the fields of color, the neon tubes read as hand-drawn lines across the surface, although they are sometimes so bright that they are blinding to look at, creating afterimages. Weatherford has used one or as many as five individual tubes, often bent away from the surface, and on occasion extending beyond the edges of the canvas. 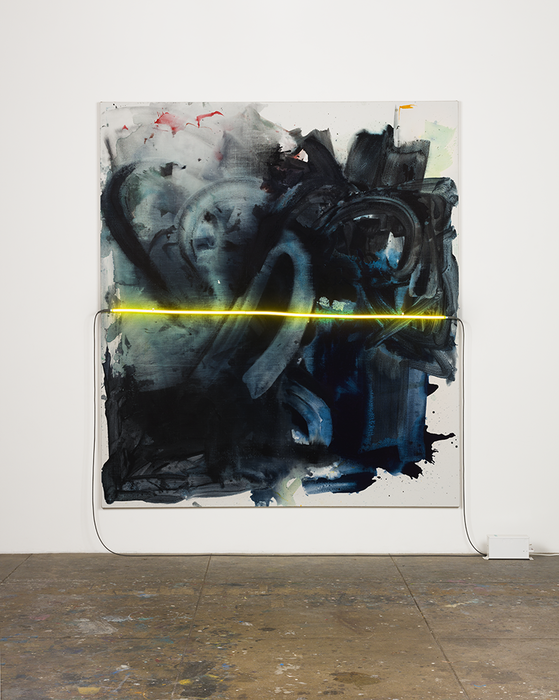 The cords for the neon fixtures make their own layer of drawing on top of the painting, and lead down to large magnetic transformers sitting like anchors on the floor. While Weatherford’s previous paintings have mainly made reference to the experience of places or climates, her new ones find their inspiration in situations and events. Drawing upon her responses to current events and her experience of premodern narrative pictorial compositions, she thinks of these new canvases as aspiring to the function of earlier history paintings that tell of actual or mythological happenings to invoke fundamental and topical concerns.